i'm currently reading a book titled 'Like the Flowing River' by Paolo Coelho, which i've discovered underneath a bunch of random magazines and ashtrays filled with murky brown unknowns at bobby's place :) within the first few pages of short stories and collections, i was hooked. so bobby lent the book to me, because he's just really that kind :P thanks! being strictly honest, i've never read any of Coelho's previous works. not even 'The Alchemist' -- which became a Brazilian bestseller and went on to sell more than 65 million copies worldwide, thus establishing itself as one of the best-selling books in history. the book has also been translated into more than 67 languages, winning the Guinness World Record for being the most translated book by a living author. however, i'm not here to talk about 'The Alchemist'. i'm here to talk about 'Like the Flowing River'. of course, i'm not exactly done with the book yet -- i've got about 20+ pages to go, but then again, what's the rush? i'm normally done with books in a matter of hours, but this book is one to savour ... slowly. 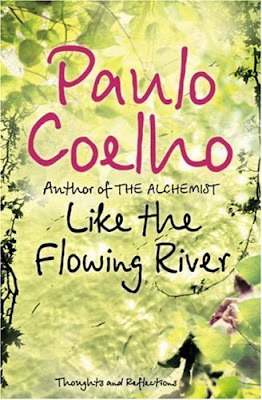 'Like the Flowing River' is a collection of intimate short stories and reflections from Coelho, written from 1998 to 2005. these are powerful tales of living and dying, of destiny and choice, of love lost and found. mostly, he shares his view about religion and signs, talks a lot about his pilgrimage and shares meaningful legends. sometimes humorous, sometimes serious, but always profound and deeply insightful; this book is at once impactful and explores what it means to be truly alive. my favorites are probably the three-parts short stories titled, respectively, 'Manuel Is an Important and Necessary Man', 'Manuel Is a Free Man', and 'Manuel Goes to Paradise.' the stories beg the following questions: why do we work so hard, why do we always need to be so busy? is it so everyone can see how responsible and important we are in this world? truly mind-provoking read -- it's like that saying ... "we gotta take time to stop and smell the roses", except with more words and plot twists. so yeah. i like the book, and now i'm on the hunt for The Alchemist. cool~ i need to read more books to improve and upgrade myself~=). aww. yeah the book's not too bad! maybe you could read it online for free :P sometimes i download my books on 4shared.com.